Well that has you interested doesn’t it? What is the job you speak of I hear you say. Well it’s my job, no I’m not that lucky to be earning that amount of money (I wish I was) It’s actually the value of being a mum. If a mom was paid for all of her hard work then that’s the whopping figure that she would be close to each year. 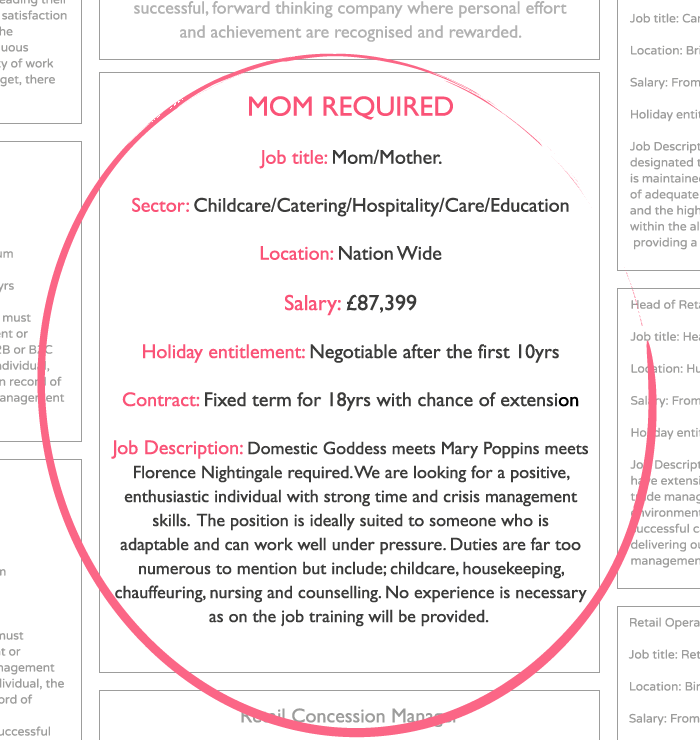 With Mother’s day just around the corner Prezzybox came up with the Job Advertisement for the position on “mum” Does it seem familiar to you? If the job role of mum was actually real then yes the salary looks amazing but remember that this role is a 24/7 role with little respite. So even that mammoth wage wouldn’t actually work out at that much… It’s a little over £9.50 per hour. It’s actually a lot of hard work that sometimes can be taken a little for granted, I know this as I took it for granted growing up and didn’t realise the amount of work involved, especially during the younger years. It just so happens we know a smashing website where you can buy lots of lovely Mother’s day presents! Next articleSponsored Video: Mum you’re fabulous!